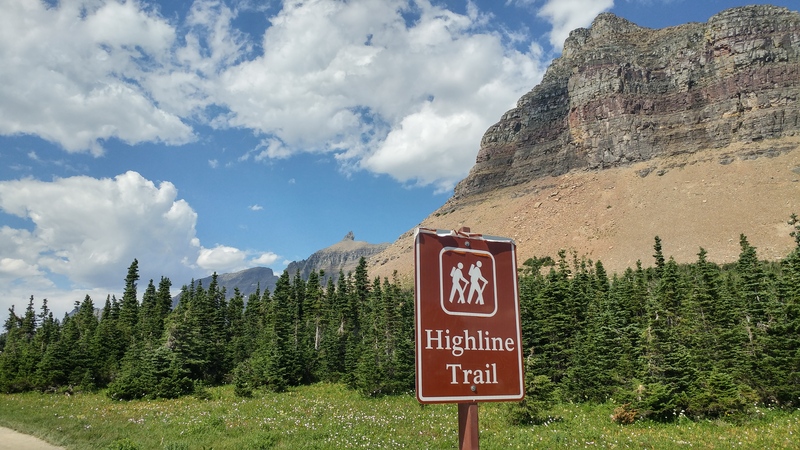 The trail starts opposite the Logan Pass visitor center. It’s upwards of 20 miles round trip, but I only hiked it for 4 miles. I’ve heard from others that past the chalet, the views are less stellar and the trail more dusty. As such, I’m glad I didn’t hike to that point so that my impression of this trail remains overwhelmingly positive. 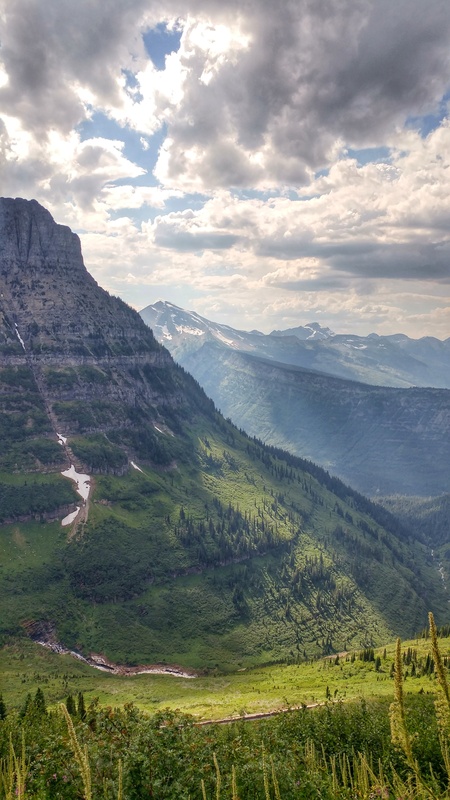 In fact, I think it’s one of the most beautiful hikes I’ve been on. 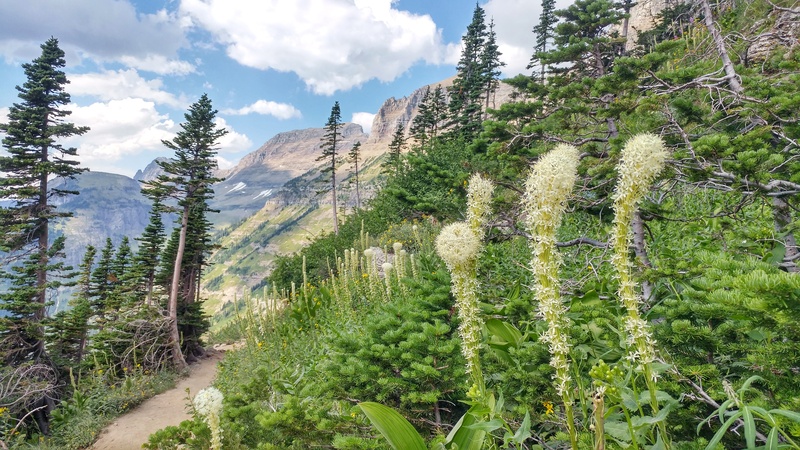 Within the first half mile on the trail, you’re treated to stunning vistas of the deep glacial valleys, several sinewy waterfalls and an abundance of wildflowers. It was an unbelievable sight. Mother Nature was definitely putting on her best show here! I wish I could impress upon you the beauty and majesty of this place, but hopefully you’ll visit one day and see for yourself. Cable portion of the trail. See the cars below? Photos can’t quite convey the beauty of this place! 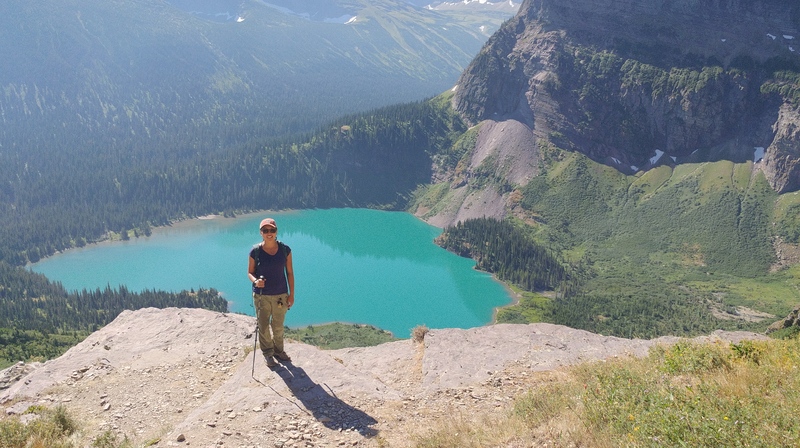 I wholeheartedly recommend this hike! 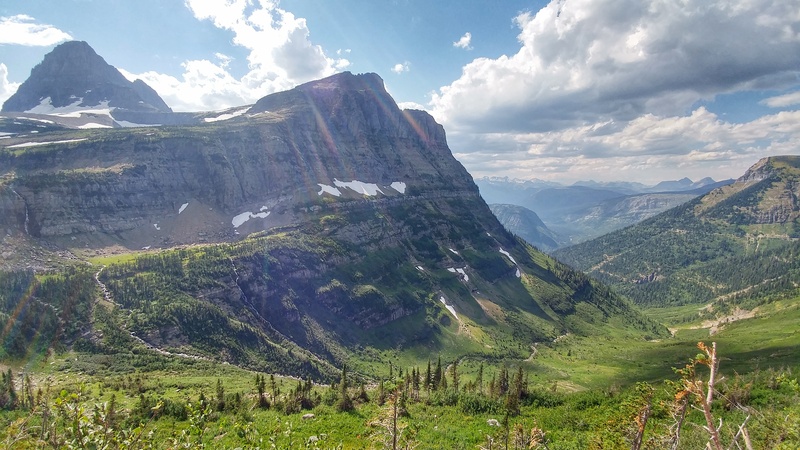 Note: the Going-to-the-Sun road is closed to vehicles over 21 feet long, six miles past St. Mary’s campground. 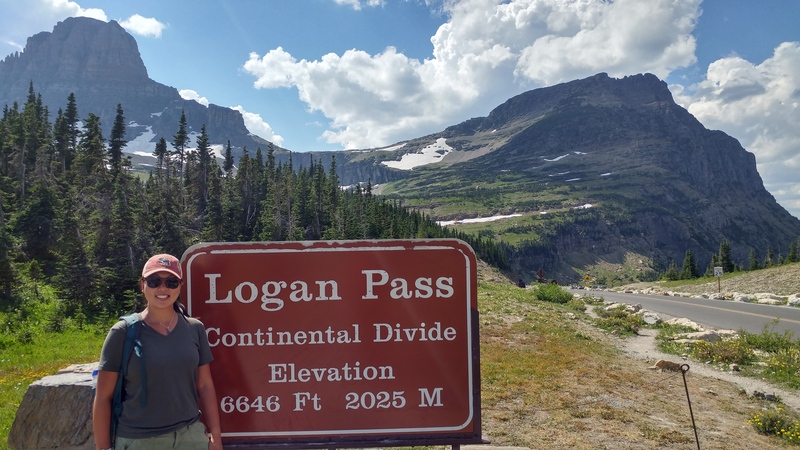 You can use the free shuttle service, available during Summer only, to get to Logan Pass (where the High line Trail starts) but shuttles don’t run on a schedule and depending on your luck, you may experience quick or slooow pickups. RV/Oversized vehicle parking: Camping at St. Mary’s campground was convenient since we couldn’t drive the motor home much further anyway! 😝 The sites are unserviced, but you have great views of the mountains, and you’re close to the Visitor Center, the only place I could find wi-fi in the park. Advanced online reservations recommended. 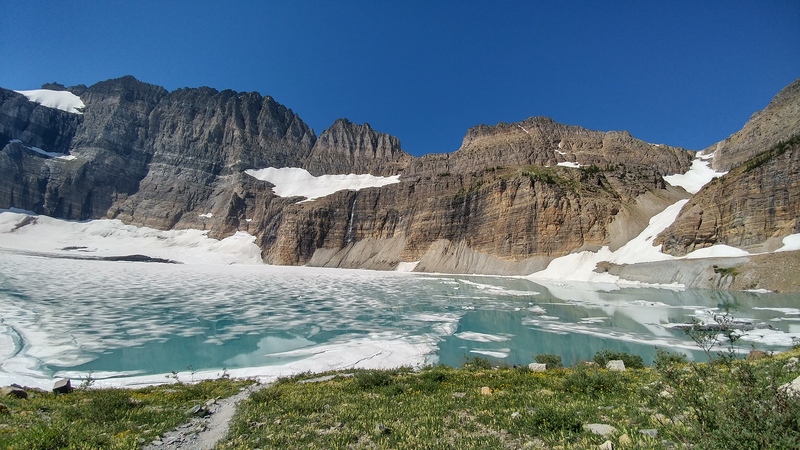 I had originally intended to only go so far as Grinnell Lake but once the trail forked and I saw what was in store, I decided to hike the 10.6 mi roundtrip to Grinnell Glacier instead. I’m so glad I did! The views are simply amazing! 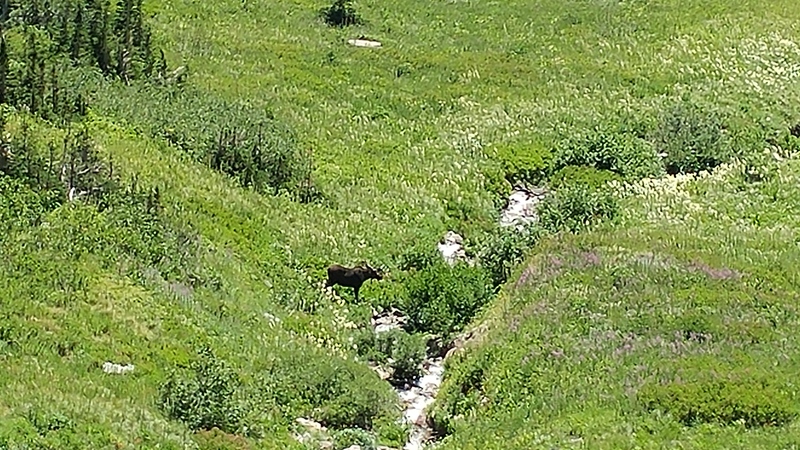 There were waterfalls, turquoise blue glacial lakes, and wildlife everywhere (I saw two moose in the valley below and a grizzly swimming in the lake). 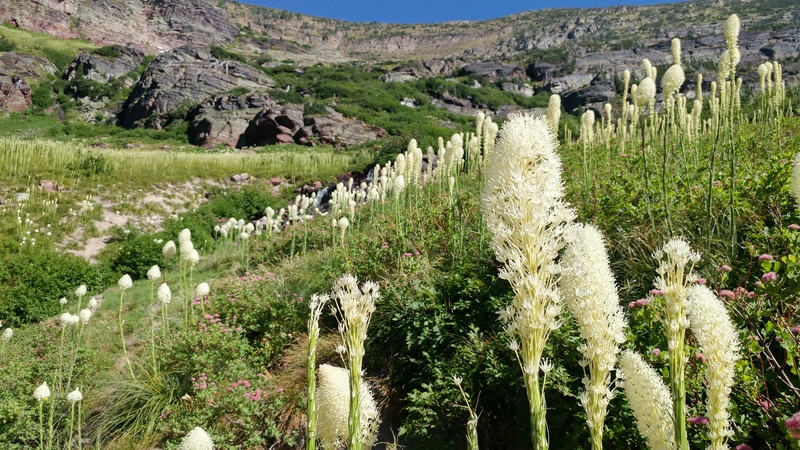 Plus, the beautiful bear grass I love was growing all along the mountainside. 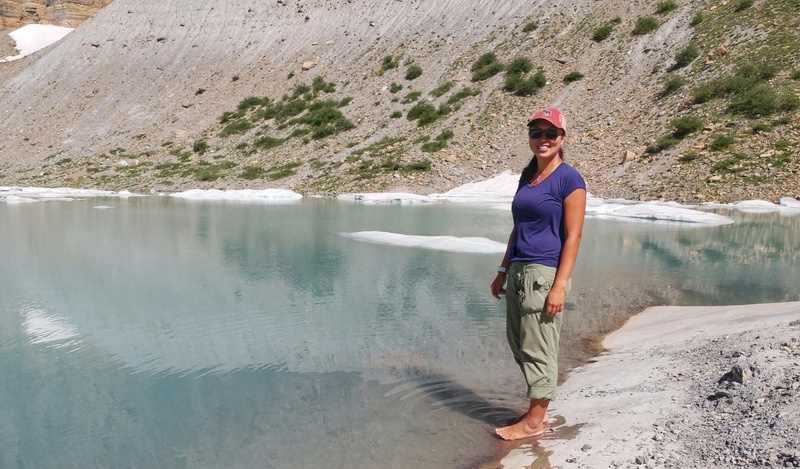 Dipping my toes in a glacial lake! 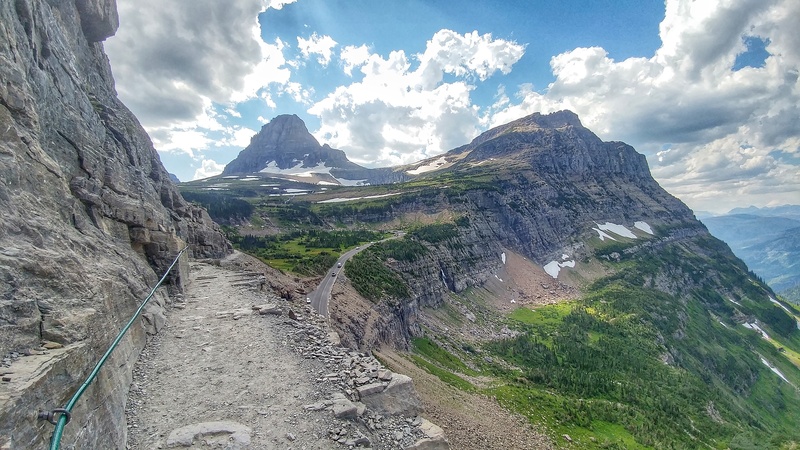 Note: I thought that the road to Two Medicine was bad but the road to Many Glacier is worse, if that’s possible. Numerous potholes and large unpaved sections makes for slow travel in the RV. 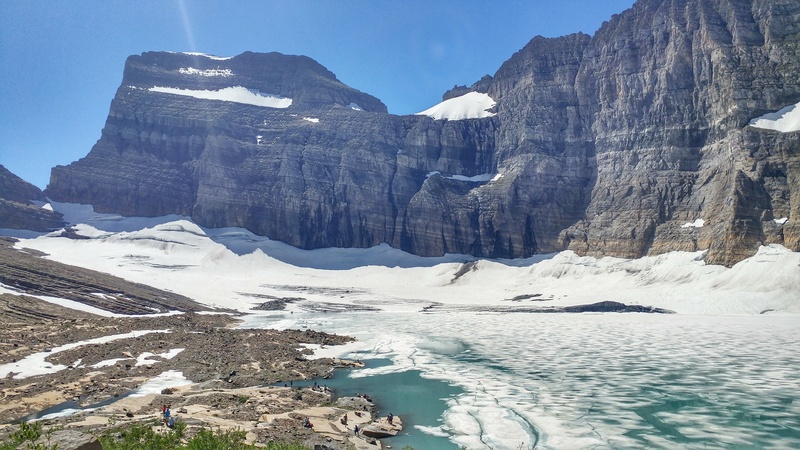 But the Grinnell Glacier hike made up for it. The St. Mary trail from the trailhead to falls is a little over a mile long one way and passes through pretty pine forest. We opted to continue on to Virginia Falls for another 1.5 miles. This portion of the trail can be moderately strenuous with switchbacks. However, you’ll be treated to cascading rivers and little falls everywhere you look.